Callaway Gardens - a 13,000 acre resort is my top pick. We go year round for the tours of the gardens, walking trails, bike trails,(17 miles of trails) swimming, and the high flying circus in the summer. 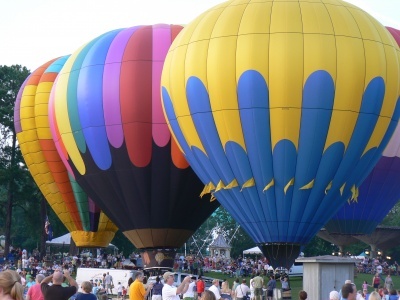 Additionally Callaway hosts several top events like the Masters Ski Tournament, Hot Air Balloon Festival, 4th of July celebration, and Fantasy in lights. You can get a year round car pass for you and 6 friends for $100. Best Value in the area. River Walk - Beautiful 14 mile walk along the Chattahoochee from downtown to Fort Benning. There is also a riverwalk on the Phenix City side of the river which is not quite as long and left more natural. You can walk out on the rocks in the river on the Phenix City side from the riverwalk. It is about 2 miles in length and very pretty as well. In the near future they intend to bust one of the dams and create a recreational stretch for whitewater rafting in this area. It should be beautiful and attract a lot of tourism. I bet that Coke Cola place is a neat place. My wife love to learn about space. I might have to bring her over that way. I like the set up of your blog and that the topic are more things to do vs national news. I am just starting my blog up and will do something similar being that one of the most visited pages on my site is Things to do in Charleston. I think that these things are what people really care about.